Nothing puts potential homeowners in the buying spirit more than walking around and seeing all the cute festive holiday decorations everywhere. So, with us officially being in the fall season, now is the best time to make your dreams of homeownership become a reality. Before you get started, there are a few things you should be aware of before you start your home search. So, to provide some assistance, your local Portland mortgage lender with the Tammi Lindley Team has listed three useful tips on searching for the perfect home. Do not start the home buying process without having an idea on the type of home you would be able to afford. Instead, talk with a mortgage professional ahead of time so they can review your finances, run a credit check and let you know what your current affordability is. This can help save you time and heartache when beginning the home search because you will know what homes to view that are within your budget and you will know which homes to avoid so you don’t risk the chance of falling in love with a house that you cannot afford. Knowing where exactly you want to live can save you a lot of time by helping narrow down your home search. Do you want to live close to work or close to a school? Would you prefer to be in a quiet neighborhood or around a busy area with a lot of bars and restaurants? Figure out what matters most to you so you have more of a plan when searching for your perfect home. Realtors are experts in the residential field and they can help you find exactly the type of home that you are looking for. Real estate agents know the ins and outs of the local neighborhoods and they even have access to more home listings. So, if you are not currently working with a realtor, contact your local Portland mortgage lender for recommendations. 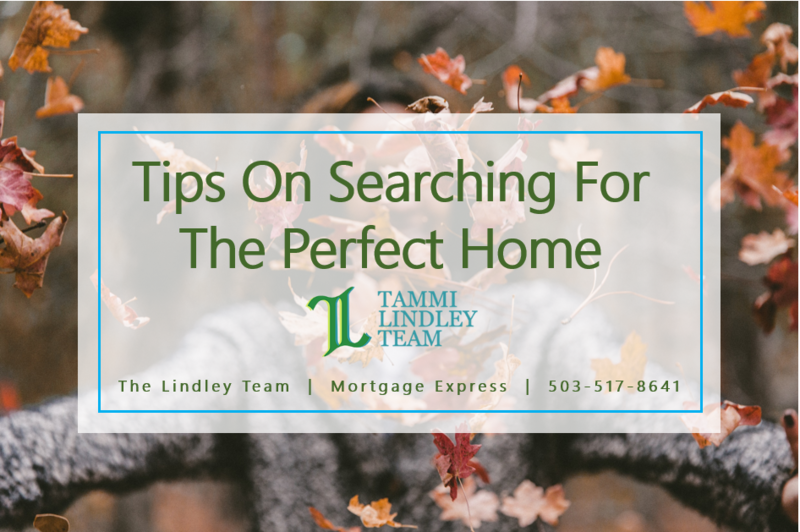 For more information on tips for searching for the perfect home or if you are ready to start the Portland mortgage application process, please contact the Tammi Lindley Team with Mortgage Express at 503-517-8641.